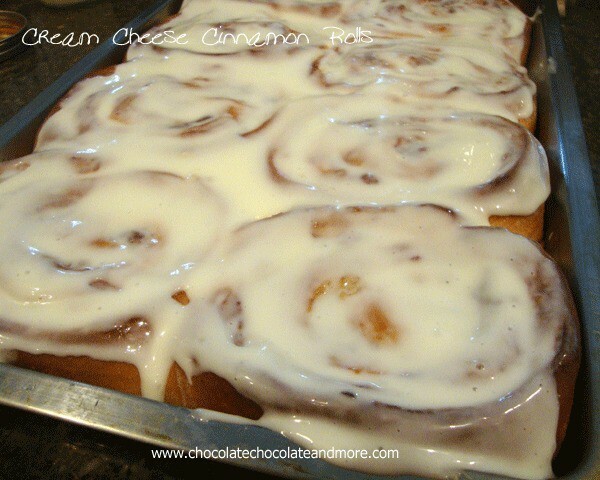 Cream Cheese Cinnamon Rolls - Chocolate Chocolate and More! Hubby had a staff meeting last week. And he asked me to make my Bisquick Cinnamon Rolls for the meeting. I know these people that will be attending the meeting. This is the south. They are either a fantastic cook, married to a fantastic cook or have a mother who is a fantastic cook. The Bisquick rolls are good but I wanted to do something more. I wanted to use yeast. I wanted them to be impressed. Let me tell you, these rolls are out of this world. The dough reminds me of a fresh crescent roll. The filling is full of flavor and since I almost doubled what was called for in the original recipe, there is enough to match the bread in every bite. And I just had to top these with a cream cheese icing. That put them over the top. These were so good, I had to make more this week, for the people that weren’t privileged enough to get one last week. Hubby had a few of his co-workers upset that they didn’t get one of these. So this tray was taken to those that didn’t get one the first time. And they got to share with everyone else. Time to make the dough. Combine yeast, 1/2 teaspoon sugar and warm water in mixing bowl. Let sit for about 10 minutes until yeast is visibly risen. Add egg, egg yolk, milk, vanilla, brown sugar and remaining sugar, stir, I used a hand whisk. Using dough hook, add flour and salt. Mix until combined, about 1 minute. Turn mixer on high and mix for about 4 minutes. Dough should be well combined but still look like a thick batter. Add softened butter and continue mixing on high for 6 minutes. Dough will be sticky but pull when you lift dough up. Remove hook and just cover the bowl with plastic wrap, no need to move dough to another bowl unless you need your mixing bowl. Let dough rise 1 1/2 hours, until doubled in size. Combine topping ingredients except for butter, and set to side. 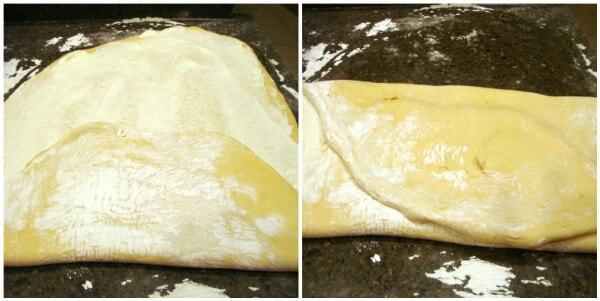 With well floured hands, punch down dough and remove to a well floured counter or board. Knead dough about 10-12 times, just enough to remove stickiness. Add more flour if needed. 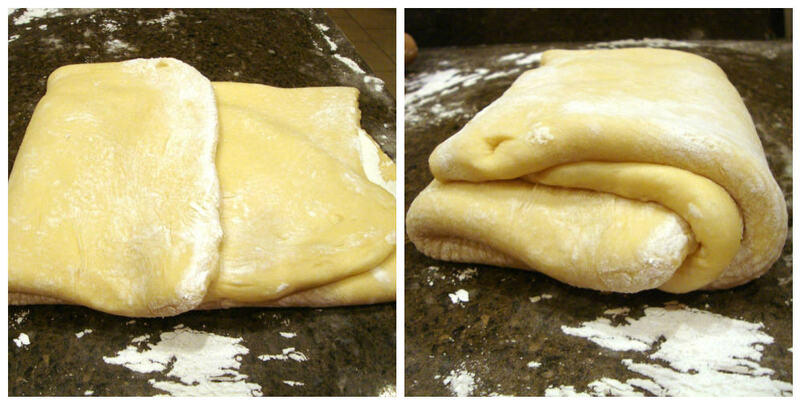 Roll dough out into a rough square about 12 x 12. Spread softened cream cheese over top. Lightly press filling into dough, now start rolling dough (I found it easiest to cut dough using a dough cutter.) Slice off ends of dough and then cut into 8 equal slices. Place in a well greased, buttered, sprayed (used what you want) 9 x 13 pan or large baking sheet if you don't want rolls to touch. Cover and let rise again till almost doubled or Place in refrigerator overnight to bake in the morning. If you refrigerated the rolls, let them come back up to room temperature (about 1 hour) then bake in 375 degree oven for 25-30 minutes. Mine were done at 25 minutes. While rolls are baking, prepare cream cheese icing. 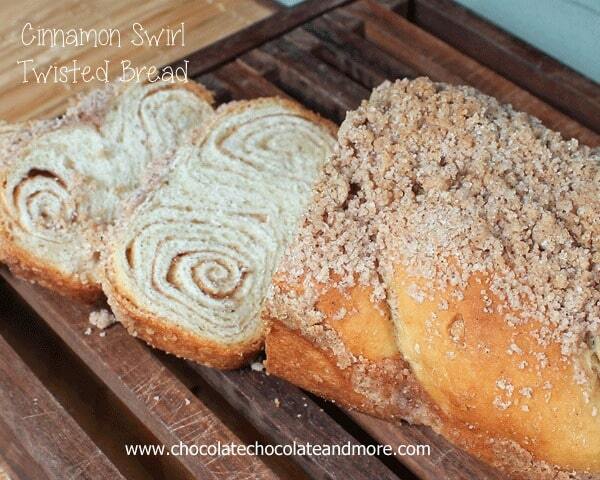 With mixer, beat together cream cheese, powdered sugar, vanilla and milk till creamy and smooth. Add milk if necessary to get that perfect thick but pourable consistency. As soon as you remove rolls from oven, pour remaining 1/4 cup melted butter over hot rolls. Let sit 5 minutes then ice or serve icing on the side, your choice. They look fantastic! 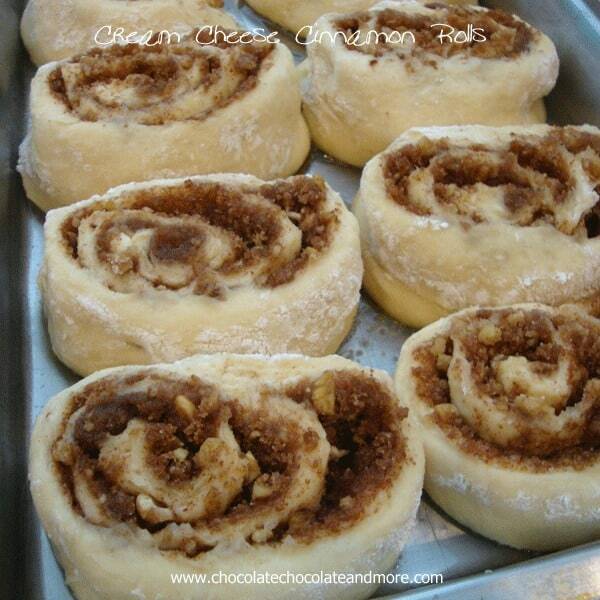 I’ve never made cinnamon rolls before, but I really want to give this recipe a try. Oh my GOSH! They look amazing! I love the addition of the cream cheese! Now you’re teasing me with something sweet and fabulous! 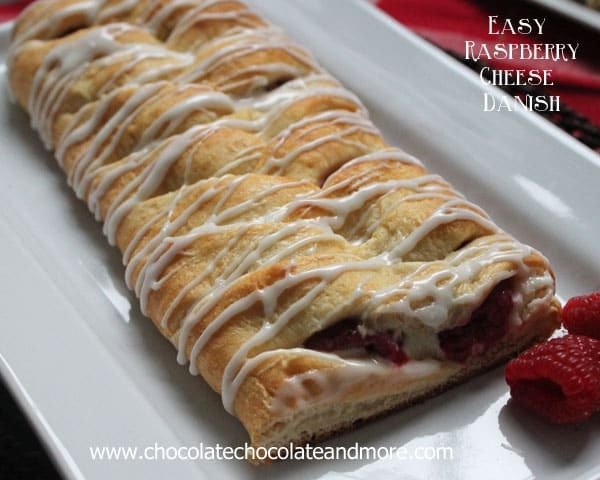 These sound awesome, I love the cream cheese in it! One of these days I’m going to find the courage to make homemade cinnamon rolls and so I’m going to pin this for future reference! You have been awarded the Versatile Blogger award. Stop by my blog to collect your award. Woww.. looks absolutely tempting.. thanks for sharing !! 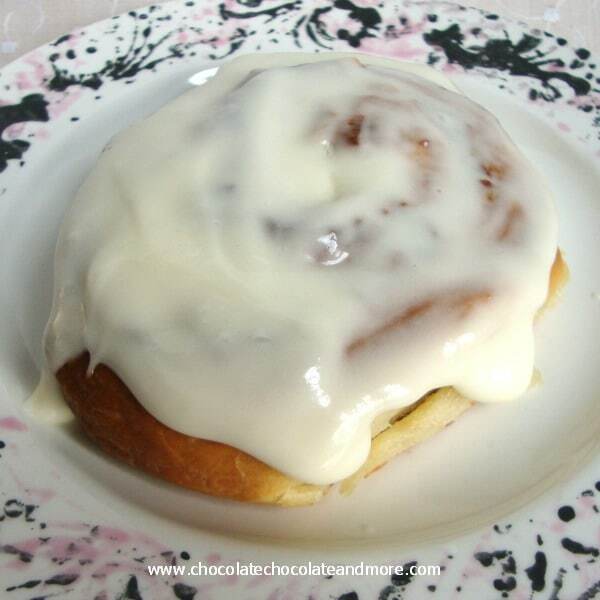 I just love cinnamon rolls and yours look just fabulous! YUM! (I feel like I always say this on your blog posts… LOL!) So very tempting! Thanks for sharing at oopsey daisy! 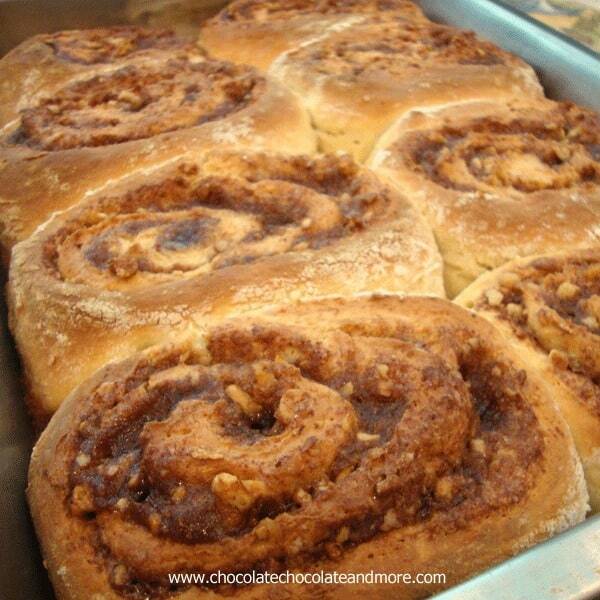 I haven’t made cinnamon rolls in a while – too long – and these look fabulous! Thanks so much for sharing at Mom On Timeout! Can the dough be made the night before? yes it can! Just cover tightly with foil and place in the fridge till ready to bake. Bring to room temperature, about 30 minutes, then bake as directed. I am making the dough tonight for a group that will be here friday.. should i keep it in the roll the cut and bake the morning of? I’m sorry I didn’t see the comment sooner, I usually cut the rolls, place them in my baking pan and then put them in the fridge overnight for baking in the morning. It’s a really good recipe but the dough needs a little more flour in it. For some reason the dough didn’t come out the way we expected too. Other than that it was pretty good. Hi! 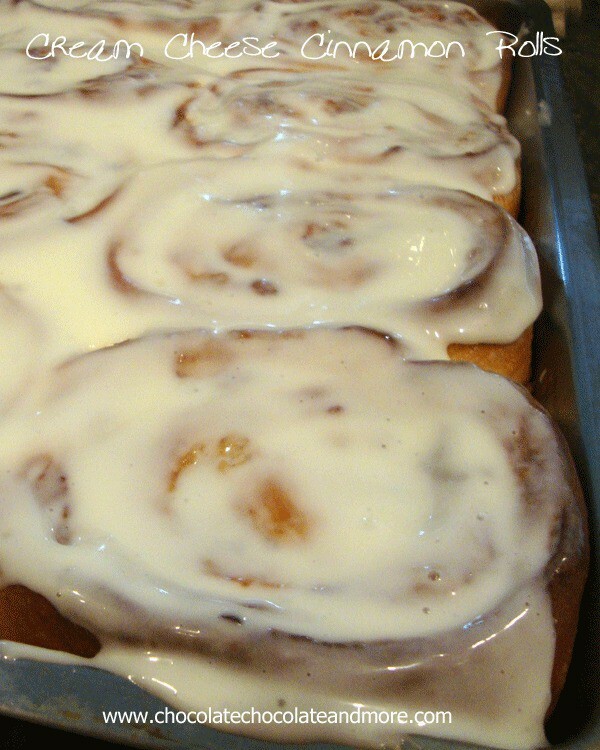 My dad has been asking me to make cinnamon rolls and I absolutely love your recipe. My problem is that I have a small toaster over. Can I make the rolls smaller to fit a smaller pan? Or a round pan. How long will I have to cook it the thank you!